I read last week that a new remake of PRISONER (CELL BLOCK H), WENTWORTH, has just started shooting in Australia for TX in 2013. 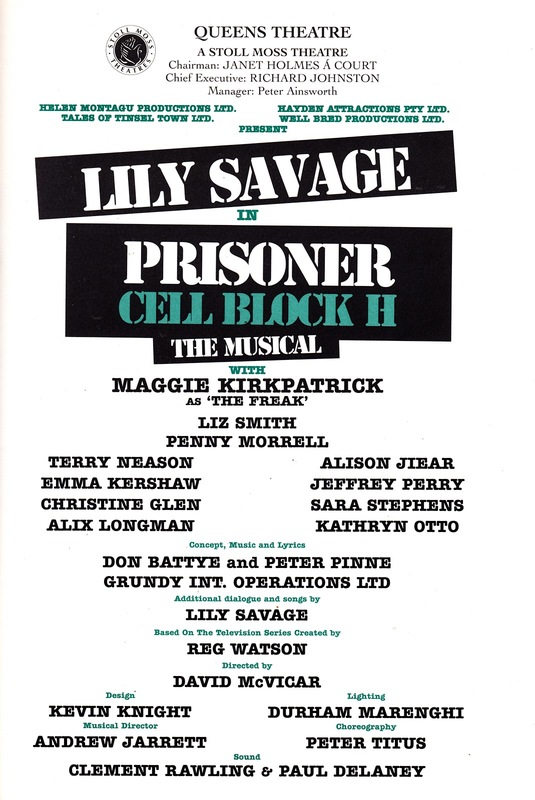 That bit of new sent me scurrying back to the Slow Robot vaults to unearth this: the program for the West End run of PRISONER CELL BLOCK H: THE MUSICAL. Frustratingly, I can't remember which year I went to see this (although I'm almost certain it was during September) and there doesn't seem to be a single date printed anywhere inside the program. The wiki entry for Prisoner is a little vague, suggesting either 1995 or 1997. I'm almost certain it was the former, but I'm not 100% sure. 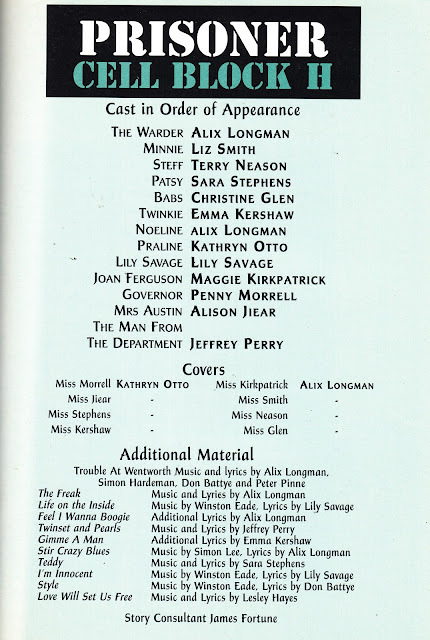 The program is longer than the pages I've included here, there's the usual mix of cast and crew profiles and the obligatory advertising. I remember that we (Hi James - And thanks!) 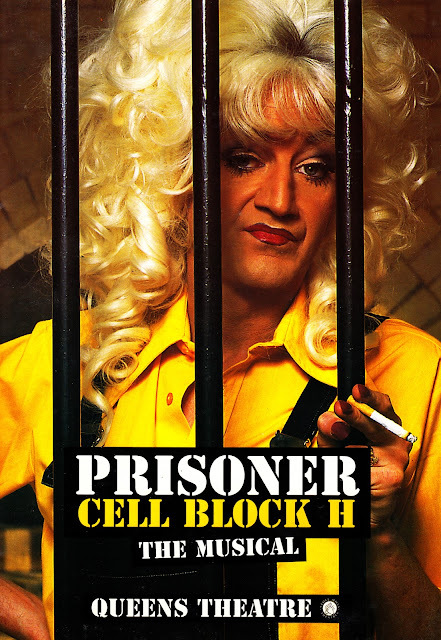 were notified that there was a possibility that the performance we were going to see would be filmed, presumably for a VHS release. However, there wasn't any evidence of filming taking place so I assume the plan was scrapped. A quick scan of the 'net suggests there was no commercial recording (audio or video) ever released. Which is a great shame. Was it any good? To be honest, I don't really remember. I'm not very familiar with the TV original and couldn't say whether the spoofy nature of this stage version did it any favours. But I do recall that I thought it was great fun. 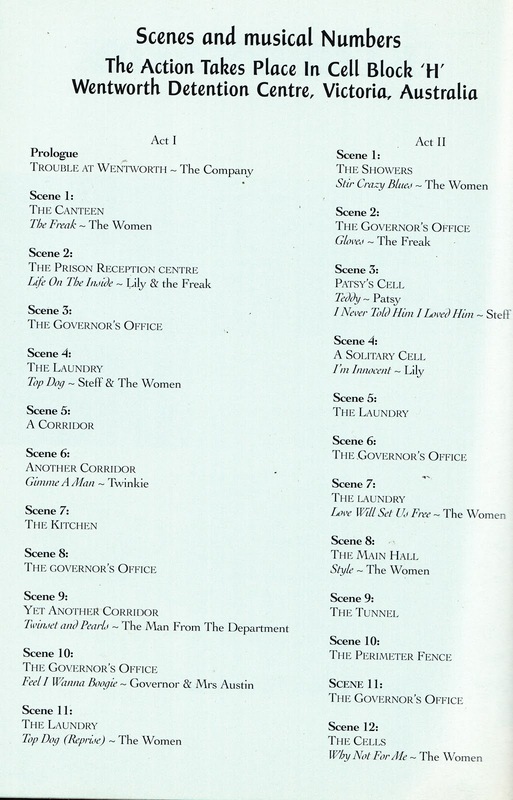 The TV show itself was a mainstay of ITV's late night/ overnight schedules throughout the late eighties/ early nineties.